Not content with Monday's jig at O'Briens, we sync-ed diaries for that elusive Friday feeling. Usually, if we're due to meet in Ipswich, I'll work from home that day: easier for everyone, esp. me. But at noon, I found myself at RAF Martlesham. Quick, only 4.5miles back down the infamous Grange Farm cycle path. Arrived greatly glowing and badly in need of 500ml of Oasis citrus punch from Cafe Tempo opposite ambulance liaison. Where? It's the caff, maybe one of several, within Ipswich hospital on Heath Road. Sells tea and cakes, open to the public, has seating, therefore qualifies for inclusion. Favourable first impressions: lots of light and minimally furnished. Half expect a telly on the wall, like the place in Felixstowe library. For eats -- yes, it's hospital food -- there's some sad-looking sausage rolls and life-support jackets, plus a chiller cabinet of prepacked goodies. I'll take the meal deal with a Lincolnshire Sausage Breakfast by Premier. Bit soggy and not up there with the handmade equivalent at Enjoy. On the walls, it'd be good to have a bit more artwork and not just the odd A4 sheet warning about only consuming food purchased on the premises. Sweet stuff is similarly South Mimms lacklustre. Those muffins and pastries are a cry for help and the unfortunate by-product of a captive audience, methinks. Americano was OK, and my retro eye plumped for a Cadbury Snack, those small choccy biscuits that I thought had gone the way of the Texan bar. Now I'm h-a-p-p-y. 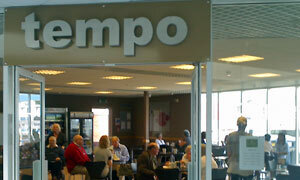 Seriously, Cafe Tempo, isn't it time to get inspired? If it was a car -- Hyundai Amica. If they were passing by -- Brenda Blethyn.